The faculty at the McGann Postgraduate School of Dentistry were handpicked to provide a full range of training. Students will get a strong education from a large spectrum of academic leaders in their fields. Since cosmetic dentistry should be looked at from many perspectives, we developed a multi-faceted program. Students gain the comprehensive understanding to be able to treat or manage the case efficiently for all types of esthetic cases. Dr. Luis Segura-Mori is a leader in Implantology and Esthetic Dentistry, lecturing extensively at several national Universities and around the world, as well as authoring several scientific publications. Doctor in Dental Surgery, University Complutense of Madrid. PhD in Dentistry, University of Oviedo. MSc in Oral Rehabilitation, University of Oviedo. Postgraduate in Implant Dentistry, University Complutense of Madrid. Graduated in Advanced Orthodontics, Progressive Orthodontic Seminars. Certificate in Periodontal Plastic Surgery, University Complutense of Madrid. Professor of Implant Dentistry at Alcalá University of Madrid. Ex-Professor of Oral Rehabilitation at University of Oviedo. Private practice in Madrid, Spain. Dr. Bart J. Polder is a popular lecturer nationally and internationally with a focus on combined orthodontic and dental implant treatments. He mainly focuses on oral implantology and orthodontics in his practice as well. Bart J. Polder graduated with a degree in dentistry at the Radboud University Nijmegen in 1984. In 1984 Dr. Polder started a private practice “Medisch Centrum de Houttuinen” as a general practitioner (with his colleague and wife G.C.G. Polder-Span) in the city of Emmeloord. From 1996-2003 he did research on prevalence and treatment methods for dental agenesis at the department for Orthodontics and Oral Biology at the UMC Radboud Nijmegen. Dr. Polder is currently taking his doctoral degree in Nijmegen, at the Radboud University, Faculty of Dentistry, Department of Orthodontics and Craniofacial Biology (Head: Prof Anne Marie Kuijpers-Jagtman DDS PhD). His subject is the prevalence and signs of dental agenesis as the results of the treatment of agenesis patients. From 1989 until now he has been associated with the Department of Special Dental Care (Centrum voor Bijzondere Tandheelkunde) at the Isala Clinics Zwolle. His work here concentrates on diagnostics, coordination and treatment of patients where implantology and/ or orthodontics is indicated. The treatment of oligodontic patients plays a large role in this. Since 2002, he started the referral practice of orthodontics and implantology at Emmeloord. He frequently gives and attends lectures on these topics. Dr. Flores is a Diplomate of the American Board of Periodontology and maintains a private practice in Alta Loma, California limited to periodontics, dental implants, and reconstructive periodontal surgery. He obtained his certificate in advanced periodontics and implant surgery from Loma Linda University School of Dentistry. Since his graduation in 1996, he has been a part time faculty in the Advanced Program in Periodontics and Implant Surgery at Loma Linda University School of Dentistry. 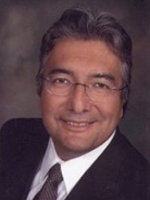 Dr. Flores is member of American Dental Association, California Dental Association and Tri county Dental Society. He lectures on esthetic periodontal plastic Surgery, periodontal regeneration, soft and hard tissue augmentation. Dr Vahik Paul Meserkhani has lectured extensively on the subject of Prosthodontics and Implant dentistry both nationally and internationally. He graduated in 1987 and Joined Loma Linda University school of Dentistry in 2003. He received his implant surgical fellowship from Loma Linda University followed by a certificate in Prosthodontics and MSD degree in Prosthodontics specialty. He had numerous publication about Prosthodontics and implant related subjects as well as a recent study at the Loma Linda University about the accuracy of stereolithographic models. He is a Diplomate of the American Board of Oral Implantology, Fellow of the American Academy of Implant Dentistry, and Board eligible by the American College of Prosthodontics. He maintains a private practice limited to Prosthodontics and implant dentistry in Glendale, California. Dr Fernando Munguia is an Assistant Clinical Professor, Department of Prosthodontics, Loma Linda University. He is a Board Certified Prosthodontist, Diplomate of the American Board of Prosthodontics, Fellow of the American College of Prosthodontics and Fellow in Implant Dentistry. He graduated from the Advanced Education Program in Prosthodontics and Fellowship from the Center for Implant Dentistry Program at Loma Linda University. Dr, Munguia holds an specialty in Health Administration, Victor Alzamora Castro Post-Doctoral Program, Doctor of Dental Surgery, and Bachelor of Dental Surgery from the Cayetano Heredia Peruvian University. He has a private practice in Upland, California.